An update to our most popular unlined bib, the R01, these men's overalls were designed using feedback from our Carhartt Crew. Every detail, from the front-to-back kick panel on the cuffs to the extra stretch around the waist, was informed by the hardworking people who wear our gear day-in and day-out. Dependable and durable, the bibs are made with our heavyweight cotton duck. They have elastic suspenders, a double layer at the knees, and ample pockets. Machine wash warm with like colors. Do not bleach. Tumble dry medium, re move promptly. Steam iron shell only. Very different from the classic cut. Kind of my new fave. Pockets in front are super short. Just got a pair in the mail and they will be headed back this afternoon. The material is not the same as the r37 or any of the other duck products. It’s thin. Really good for homeowners I guess. But these will be trashed in less then a week doing masonry. Also the pockets are great if you have children’s hands. The depth of them will make sure you lose everything down below your truck seat. Also carhartt needs to bring back the Sherpa lined pants that zipped to the knee. We're sorry these did not meet your expectations. They are a 12 ounce cotton duck fabric. Please contact us at 1 800 833 3118 if you need any assistance. Way better fit than the originals.. They are great. The fit is so much better than the original overalls where you had to size up for an awkward fit. I’m a slim 5’9” and these are great to work in around the farm. I over sized a little to much but as usual Carharts are still the best. First things first, the fit of these overalls is fantastic. 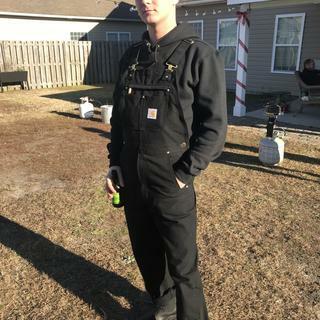 I would argue that these are the most comfortable overalls Carhartt has on offer. This bib does fit a touch loose to the body, so if you prefer a tight fit, consider sizing down slightly. The elastic waist will make room for you while still being plenty comfortable. The only flaw can find with this bib is the pocket sizes on the front pockets. They're much shallower than you would expect, almost as if these pockets were designed for women's jeans rather than men's work wear. Despite being a minor annoyance, I don't think the pockets will present an issue for those of us who want these overalls for DIY work around the house. However, I would expect anyone who wants these for their professional work might find the pockets lacking. The front hip pockets are way to small, you can't put even standard tools in them without them falling out. There the same type of pockets that are on women's Jean's. The back pockets are also small as well. Other than the pockets, the fit is just right. We appreciate your feedback and have shared it with Product Design. Please contact us at 1 800 833 3118 if you need assistance. Accurate description of the all the upgrades to this new bib. Carhartt quality at it's best. Front pockets are very shallow, I feel if I put something in them it's going to get lost. Any idea of the reasoning for such shallow front pockets? Very impressed with the new design. I am again very disappointed in the design and fit of these new style of Carhartt bib coverals. All of the bibs are designed and cut for men who are extremely “spherical” and overweight. The new bibs are even worse. Could you please make a line of bibs that are cut for men who are physically fit- not overweight? We're sorry to hear this but do appreciate your feedback. Please contact us at 1 800 833 3118 if you need assistance. Sized up because my R01s were a bit snug in my size, but definitely didn’t have to with these. They definitely run larger than the traditional R01s. I usually wear a 32x32 pant, and could have ordered a 32x30 pair of these or a perfect fit. Otherwise, these are very comfortable, and the quality is obvious. These are great and you can store many stuff in all the pockets it has. The material looks and feels durable. I highly recommend these to anyone looking to get overalls. Good quality. Friend really liked them. I got them for my boyfriend for Christmas and he loves them! 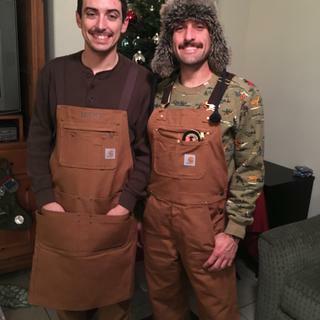 My bf was super happy with these overalls! They are great for work and awesome quality. They are perfect and my son lies them as always! We can always depend on your quality! We bought them for my son in law as a Christmas present. They were made of a very sturdy material and will keep him warm in his outdoor activities. He really liked them! The only bibs i'll ever need. Above and beyond my expectations. These bibs handle it all from manual labor to mountain biking. Exceptional quality has stood up to immediate testing at the homestead and in the back country. Thanks for a solid product Carhartt! Great overalls except one small flaw. Bought for my son about a month ago. 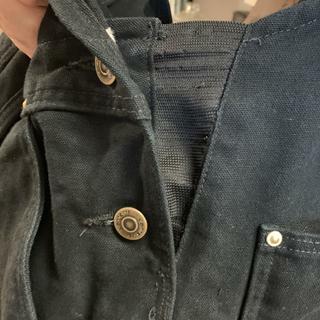 Elastic in side panels started fraying after 2 washes. Likes them other than that. Bought these for my son. These were taken after 2 washes. Only had them for about a month. We appreciate your input and are sorry to hear this. Please feel free to contact us at 1 800 833 3118 for further assistance. I bought these for my boyfriend for Christmas and he is obsessed with them. He seriously wears them constantly and thinks he looks so cool. Definitely a happy dude. The clasps that other people have mentioned are really not that bad to figure out and after a while are easy enough. The most rugged clothes out there. I bought the black bibs. I wear 34x32 in jeans, I bought 38x32. I washed and dried them, they fit perfect. They are a little loose so I can bend over, and they don't ride up. The bottom of the bibs don't slide over my boot. I like the new design. Pocket are shallow, but it make them easy to get into. I know your not suppose to wash and dry them, but eventually you will have to wash them when they get to dirty, so I wanted to make sure of the fit are wash and dry. Great customer service at the Cascade Station location! Another example of the quality you’d expect from Carhartt. Great fit....I do not like the fasteners. I really like these bibs except for one thing. The way the shoulder straps connect is almost impossible to undo. This can be very frustrating when it’s time to take them off. I honestly would not buy another set that has this type of connection. I love my bibs, third pair i have purchased. very durable. they take a bit to wear in and soften up. that and the straps could be just a bit longer. other than that they are perfect. I'll buy more i'm sure! They fit great, the elastic on the sides is great my wife had done this to my last pair. I got a larger size for room for sweat shirts. Wore Carhartts for over 35 years as a lineman for a utility company and as a farmer. Great overalls, wonderful quality but runs large and long in terms of height. Fits well true to size. The cut feels different that the ones I bought 8 years ago but these have some “spande”? Type material in the waist. Thank you for your input. This style is made of 100% ringspun cotton duck. Please contact Customer Service at 1 800 833 3118 with any questions. Perfect fit and for what I need them for! I'm an electrician and these are perfect... great knee pads, heavy material for wear and protection. Nice overalls. Constructed well. Very sturdy. The new improvements to the old standby R01’s are excellent. The elastic side panels work well and the full double front with the doubled cuffs look as if they will outlast the old design. Good quality, pockets need to be deeper. 1st of all I love the Brand and I am overall happy with the Bibs. 2 things can be improved on. The clips on the overalls that secure the shoulder strap could be better designed to make it easier for on and off. The bigger improvement that needs to be made is to the hip pockets. They are not deep enough to hold common tools or work gloves securely. Stitching and quality were up to standard. I do wish they were made in the US. Thank you for your feedback. We have forwarded this review to our Product Design team for further consideration. Extremely comfortable and long lasting, great update of the style r01! Are you planning a model of this exact bib with the zip to the knee feature soon? Please? Please? Please? The Chest pockets on this model are awesome but I have to have the zip the knee feature. BEST ANSWER: Yes, we plan to update our styles in the near future. Keep an eye out for an updated quilt lined washed duck bib overall with ankle to knee leg zippers in Fall 2019. Why did carhartt switch the pockets over to the left leg? I keep my channellocks and level in my right leg pockets and my striker for my torch hanging from the left leg loop on all my other overalls. It is very disorienting having everything thing reversed..
BEST ANSWER: This style is an update to our most popular unlined bib, the R01. These men's overalls were designed using feedback from our Carhartt Crew, who are real people who test our products. Every detail, from the front-to-back kick panel on the cuffs to the extra stretch around the waist, was informed by the hardworking people who wear our gear day-in and day-out. We are sorry to hear that it is disorienting for you. BEST ANSWER: The size depends on what your waist measurement is and if you will be layering heavily underneath. The measurement may vary by size. Please contact us with the size you are interested in for further assistance. You can reach us by phone at 800-833-3118 Monday-Friday from 8am-9pm EST and Saturdays 9am-5pm EST, by Live Chat Monday-Friday 9am-12am or Saturday & Sunday 9am-9pm EST or anytime by email at just_ask_us@carhartt.com. I wear size 34×34 in jeans. I just had a pair of 34×34 bibs delivered and they are to long and to tight. What size should I go with if I'm a 34×34? 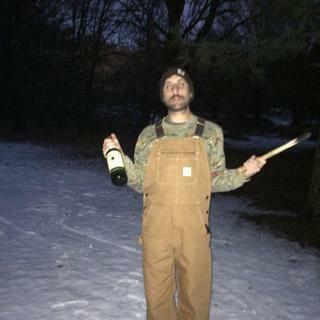 Does Carhartt make a Duck Bib Overall/unlined with a 44 waist 38" inseam? Can they be special order? If so how much would they cost? BEST ANSWER: We are sorry, we do not make this size. We do not offer special ordering at this time. My husbands old worn out R01 are 44 x 32 and he wants to replace them with the 102776 new and improved unlined bibs. But in jeans and dickies he wears and 38 waist pant. Obviously there's a big differene in 44 and 38. Which size should her order in the new bibs? Please provide a sizing comparison for those of us replacing R01 with the new and improved bibs or I'll have to go back to the R01s. Its hard to imagine him wearing a 44 in the original bibs and going all the way down to 38 like you suggest in the new style. BEST ANSWER: The style 102776 will be sized differently than our R01's. We recommend ordering the same size as you would in our pants or jeans. How does the #102776 fit when compare to the #R01? The information provided is not overly detailed. I'm looking to replace a well-worn pair of #R01. I love them but the fit is not great. In Levis or Wrangler jeans I wear a 35x32. In the #R01 I have settled on 36x32 (I do not wear them over pants). The waist is good, but if I wear a heavy shirt I need to leave the upper side button open. Also, the legs are huge (way too wide). If I purchased the #102776 in a 36X32 would the legs be less wide? How about the belly area? Can you please post these measurements for both the #102776 and the #R01? Thanks! BEST ANSWER: The new style 102776 is sized a bit larger than the R01. If you are not going to layer underneath, you would order your normal pants size. If you do want to wear heavier layers underneath, you would go up one size. Is the torso on these longer than the torso on the one without the zipper on the bib? I tried both these and the plain button bib and the crotch seemed lower on these. Also does the inseam effect the crotch height? I tried on 30" inseam in the store but I would order a 28" inseam online. BEST ANSWER: The 12 ounce duck is a tough fabric, but it does not feature any insulation or lining. You may like style R41 or R03. What size are the bib pockets? BEST ANSWER: The two pockets will hold a 3" x 6" cell phone in a case (as long as the case isn't too bulky) and a 3' x 5" notepad or anything else that size. The zippered pocket is about 6" deep x 7 1/2" wide. The three pencil holders are great for lumber pencils and Sharpies. Hope this helps, these are great bibs! Big enough for a pack of cigarettes and a phone. Do you make a 54 x 36 bibs in duck? Need some please and love them. BEST ANSWER: We apologize, but we do not make this style or any duck bib overalls in the size 54x36. Will these shrink in the dryer or will the size i try in the store fit after the first wash? Or will they shrink? BEST ANSWER: As long as you follow the care instructions, they should not shrink more than about 2-4% over the lifetime of the garment. What is new about these? The photo makes them look slimmer. BEST ANSWER: The sizing will be different. You will order your pants size. You will go up a size if layering. These will have side stretch pockets. True Fit recommends I buy this item in the same size I wear in Carhartt relaxed fit cotton duck work pants (30x30), which fit me perfectly. Will these overalls in a 30x30 fit around my waist and seat the same as the work pants, or are they different? BEST ANSWER: This style should fit true to size and we would recommend going with your normal pants size. BEST ANSWER: They do not, but we will gladly share your feedback with our Product Design department. The style R01 does come in dark navy: https://www.carhartt.com/products/Duck-Bib-Overall-Unlined-R01. Are they going to release the carpenter bib style with the extra pockets? BEST ANSWER: The Duck Carpenter Bib Overall, style R28, is discontinued. We have forwarded this to our product team as a suggestion to bring this style back. How do the knee pads work? BEST ANSWER: We do not sell knee pads, but some customers choose to purchase the SoftKnees knee pads to insert through the cleanout bottoms of the double front area. At the bottom of the double fronts there is a hole where you can roll up the foam knee pads like a newspaper and slide them in. Once inside they will expand(unroll) and fit in place where you will be kneeling. No straps, no adjusting every time you kneel and best of all no more sweaty back of the knees. What is the leg opening on these? Does this style come with zipper at bottom of bibs?